Annotations shown in real-time in your browser. AirSketch Pro is now in the App Store. Open multiple projects, smoother ink, zoom-sync and more! Check it out here. Turn your iPad into a wireless whiteboard! 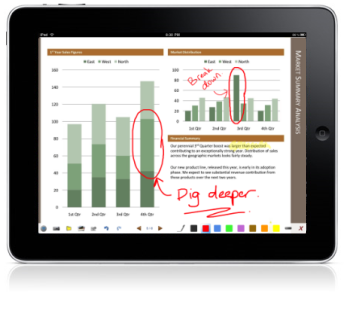 Annotate PDF documents and images live. You can now project PDF documents (such as exported PowerPoint or Keynote decks) to a computer on the same local network, then annotate them in real time, all from your iPad. Air Sketch is great for presentations in the boardroom, classroom, or on the go. Just fire up Air Sketch on the iPad and open the specified URL from any HTML-5 compatible browser on the local network. Your photos and drawings show up natively in the browser. There's no proprietary client software to install, or services to subscribe to. Tip: You can also find the link in Desktop Safari's Bonjour bookmarks: Show All Bookmarks menu -> Bonjour. No longer be tethered to the podium! Connect your laptop to a projector to present and draw from your iPad as you walk around the room. You can also easily pass your iPad around to allow others to contribute. Incorporate the iPad into your desktop-based workflow: Record videos of your live Air Sketch drawings, or share them live with remote colleagues via any online meeting or desktop sharing software (such as iChat or WebEx). Air Sketch is also the perfect companion for family games of Pictionary or as a virtual coloring book. Wirelessly project PDF documents, images and live drawings over WiFi (3G is not supported). Fast and fluid sketching on the iPad using your finger or 3rd party stylus (such as the Pogo Sketch). 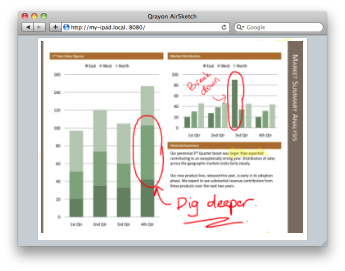 Open PDF documents from Mail or other Apps in Air Sketch to wirelessly annotate and project them. Email the full annotated versions afterwards. Real-time sketching to your browser: Strokes show up as you draw, network speeds permitting. You can record them using any desktop recording tool, such as QuickTime's Screen Recording feature. Or share your sketches with remote colleagues using any desktop sharing app such as iChat. 5 drawing tools: Pencil, pen, marker, brush, and highligher. A fully customizable color palette (tap on the selected color to edit it). Fluidly zoom and pan using 2 fingers to edit your sketches in minute detail. Instantly save and restore snapshots of your sketches using the camera tool. Secure your web connection with a username and password. You can even use Air Sketch peer-to-peer with a computer via an ad-hoc network when a WiFi hotspot is unavailable. Note: Internet Explorer versions 8 and earlier do not support HTML-5, but Internet Explorer 9 will. View more Air Sketch Tips and Tricks, and also check out the FAQs. ★★★★★ Single Most Useful iPad App. ★★★★★ Perfect for the Modern Professor. If you like Air Sketch, you'll love the All New Vittle, which turns your iPad into a recordable video whiteboard. Find out more on the Vittle homepage.